Newstead Abbey, now owned by Nottingham City Council, was the Nottinghamshire home of the Byron family but it is probably George Gordon Noel Byron 6th Baron Byron, who was born 22nd January 1788 in London and died 19th April 1824 in Missolonghi, Greece who brought the family into historical prominence. He was among the most famous of the English 'Romantic' poets. He was also a satirist whose poetry and personality captured the imagination off Europe. At the age of 10, George inherited the title and estates of his great-uncle, the "wicked" Lord Byron. His mother proudly took him to England where he fell in love with the ghostly halls and spacious grounds of Newstead Abbey, which had been purchased by the Byron family from King Henry VIII, and he and his mother lived in its ruins for a while. After travelling in the near East for two years, Byron arrived in London on 14th July 1811. His mother died on 1st August before he was able to reach her at Newstead. On 27th February 1812, he made his first speech in the House of Lords, Byron was lionized in Whig society and the handsome poet with the clubfoot was swept into affairs with the passionate Lady Caroline Lamb, the "autumnal" Lady Oxford, Lady Frances Webster, and - possibly - his half-sister, Augusta Leigh. The agitation of these affairs and the sense of mingled guilt and exultation that they aroused in his mind are reflected in the Oriental tales he wrote during the period. Seeking escape in marriage, he married Anne Isabella (Annabella) Milbanke on 2nd January 1815. After a honeymoon the Byron’s, settled in London. Delays in negotiations to sell Newstead left them financially embarrassed and before long bailiffs were in the house demanding payment of debts. 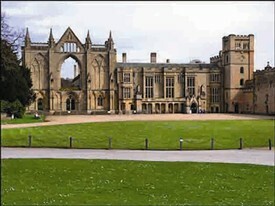 The sale of Newstead Abbey finally cleared most of his debts and left him with a small income which was to support him in Italy. His marriage ended Byron left England, never to return. In October 1816 he sailed for Italy. Along the way he continued his lustful ways with several women and por-t ayed these experiences in his poem, "Don Juan. "During 1816 Byron studied Armenian at the monastery of Lazarus on the tiny island of St Lazzaro. By 1818, Byron's life of debauchery had aged him well beyond his 30 years. He then met 19-year-old Teresa Guiccioli, a married countess. The pair were immediately attracted to each other and carried on an unconsummated relationship until she separated from her husband. Byron won the admiration of Teresa's father, who had him initiated into the secret Carbonari society dedicated to freeing Italy from Austrian rule. 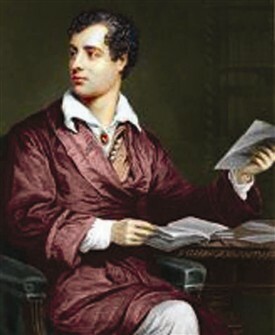 Between 1821 and 1822, Byron edited the society's short-lived newspaper, “The Liberal”. In this country it has been disputed whether or not Byron was freemason but records are not available to prove this or otherwise. There is however a Byron named Masonic Lodge in Nottinghamshire. In 1823, a restless Byron accepted an invitation to support Greek independence from the Ottoman Empire. He spent £4,000 of his own money to refit the Greek naval fleet and took personal command of a Greek unit of elite fighters. On February 15th, 1824, he fell ill. Doctors bled him, which weakened his condition further and likely gave him an infection. Byron died on April 19th, 1824, at age 36. He was deeply mourned in England and became a hero in Greece. His body was brought back to England, but the clergy refused to bury him at Westminster Abbey. He was buried in the family vault at St Mary Magdalene in Hucknall. In 1969. Eventually, acknowledging a talented, Romantic yet troubled life a memorial to Byron was finally placed on the floor of Westminster Abbey. How pure – how dear their dwelling place! A Heart – whose love is innocent! This page was added by Website Administrator on 05/11/2014.